There seems to be a growing bull's-eye on a law that has been a cornerstone of undergraduate admissions for two decades at the state's flagship university. Last week, a Senate committee discussed the possible repeal of the Top 10 Percent Rule, which requires all Texas public universities to admit Texas high schoolers who graduate near the top of their class — whether they went to school in a poor district with mostly minority students or a wealthy district with good schools that are often accessible to mostly white students. Proponents say the law boosts racial diversity at Texas public colleges. But some say the law isn't that effective and that many deserving students don't get into the state's most competitive public universities. The rule has the biggest impact on admissions at the University of Texas at Austin. About 75 percent of its freshman class is selected automatically, based solely on those students' class rank. For the remaining 25 percent, the university uses a “holistic” process, considering factors like applicants' essays, test scores and race. 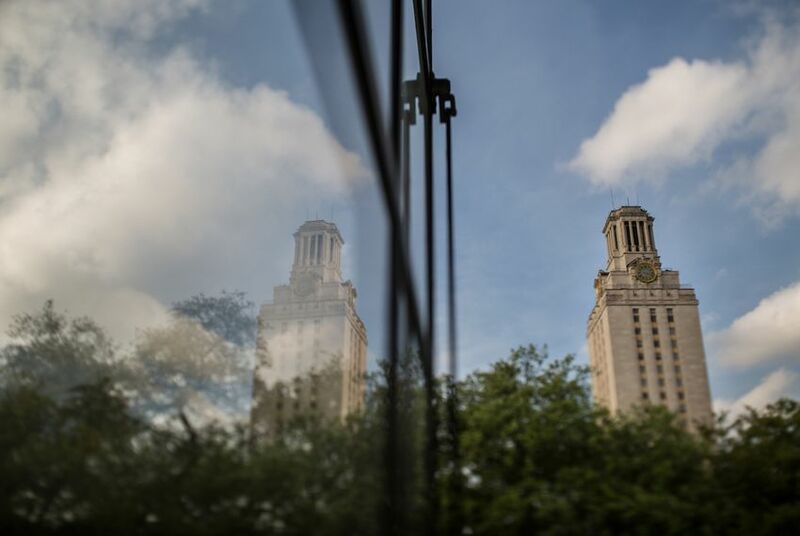 Since the rule became law in 1997, UT-Austin’s Hispanic population has skyrocketed. But at the recent Senate Higher Education Committee hearing, Texas higher education officials, who have complained about the law for years, said the state's sweeping demographic changes make it difficult to tell if the law is actually working. So what do we know about the Top 10 Percent Rule’s impact on diversity at UT-Austin? Luckily for data nerds, there’s data on both types of admission policies at UT-Austin. The school's unique, two-pronged admissions system means that we can compare the demographics of each group, using data from a report that UT-Austin submits to the Legislature each year. That data shows that the Top 10 Percent Rule’s impact on the number of black students admitted to UT-Austin appears negligible, though in general the black student population at the school is relatively small. But the rule does appear to give Hispanic applicants a boost, compared with white applicants. Another way to look at the Top 10 Percent Rule’s impact would be to examine what proportion of black and Hispanic students at UT-Austin are Top 10 Percenters. Once again, we see that the rule has a disproportionate effect on Hispanic freshmen, while Top 10 Percenters are underrepresented among white freshmen compared with the overall freshman population. If the Top 10 Percent Rule goes away and UT-Austin instead admits all students holistically — taking into account not just their class rank but also their test scores and other factors — how might the racial diversity of the school be affected? It’s worth noting that if the rule were repealed, UT-Austin would probably have to overhaul its entire admissions system. The school could come up with other ways to ensure students from poor-performing high schools can still get in — the admissions process may become more race-conscious or include more aggressive recruiting in certain parts of the state. The school could also offer more scholarships. But because of the pronounced differences in demographics between Top 10 Percenters and Non-Top 10 Percenters, it could be difficult for the university to fill the entire gap. That's apparent when looking at how black and Hispanic students fare when they apply to UT-Austin as Non-Top 10 Percenters. Hispanic and black students do far worse than white and Asian applicants when admissions decisions are left to UT-Austin. That’s probably in part because even though admissions officers should be giving their applications extra weight because of their race, white students tend to have better standardized test scores. UT-Austin provost Maurie McInnis said the holistic admissions process at the school right now is "filling in very specific holes." If the Top 10 Percent Rule were to go away, she said, the process would change significantly and the university would admit a much more diverse class than it does through the current holistic system. Read our 2016 series on the debate over the Top 10 Percent Rule. Clarification: This story was updated to say that Hispanic and black students fare worse than white and Asian applicants when admissions decisions are left to UT-Austin.